Variety Pot crock pot or in the ornamental plant traders, suggests that the popularity of container plants is popularity. You interested? See this tips first! The centers ornamental plants, or crock pot row now looks increasingly varied. Various basic materials, sizes, colors and models available to choose from. Obviously suggests that the popularity of all container plants is popularity. You are also interested to use them in the garden? See first tips below. The word 'pot'-derived from English and Dutch-clearly based on an object that functions as a container plant. Vessel here can mean two. The first, ornamental plants planted directly in the pot, the pot after the previously filled with the media before planting. The second, but a pot "tools display", where the pot is "wrapped up" the original container plants (which are usually ugly). This is especially if the pot is an item that expensive, or rare antiques. The crock is a container-usually made of clay-wide chat. Although the given name gentong (high, small talk), also classified in the family crock. Crock originally functioned as a venue more water, but slowly also used as container plants. Just like pot, ornamental plants can be planted directly, or with the pot, to include in the crock. 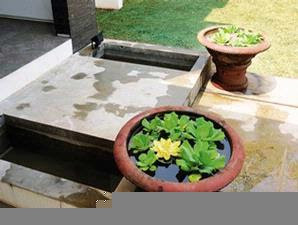 Crock generally more used to water the plants, but legally-valid only if used to plant ornamental plants that use the planting soil media. Any type crock pot and is now offered from a variety of basic materials, clay, mortar, ceramic, porcelain, plastic, even wood. Or finally finishing touch of any varies. Left plain according to the colors of nature, ornament, ornaments are given a prominent (such as profiles), combination with mozaic porcelain, stone, gravel. colored, and glazing. Overall this has been done in order to appear crock pot and interesting according to the tastes of each consumer. But before buying, you should first consider the basic nature of container and ornamental plants that will be placed there, especially if the vessel is planned to accommodate the media as well as planting trees. For example, from the crock pot or clay have any bearing nature, cause the water leak out quickly so that the planting medium dry quickly. So for the crock pot and clay should be chosen plants that need less water as many mirten. Or select the location of the pot a bit shady. If the trick is that you choose, be sure to select the type of plants that like calm (for example type in semi - door). If the vessel is used to water plants (crock-pot and clay pot and a high wide chat), in the crock pot and clay should first be coated with cement paste to cover the pore-pore walls. For crock pot or from the mortar, but is also berporus slightly more impermeable than the tebuat of clay. On the pot plastic / fiber is water-resistant and air. The weakness of the crock pot or plastic is the excess evaporation of water splash of water is obstructed so that the media often become a land too wet. As a result, the root-root plants will rot. If using a plastic pot, make sure that the holes in the bottom of a pot quite a lot. And 1 / 3 of the bottom of the pot should be given the charcoal, rock or pumice stone and enhanced with a buffer of brick or iron. Thus, the excess water in the pot will easily flow out. To this crock or plastic pail more precisely, traders are often used as a decorative plant container plant water. But the water plant will usually grow more perfect when planted directly in the clay vessel the size of the security. From the crock pot and ceramic or porcelain are also air and water impermeable. Although both are made from natural materials, after burning through the process, pores will moor. Show luxurious, expensive and heavy, this type is often used as tools display. Meanwhile, the pot timber more suitable for ornamental plants that use the media chopping fern plant, elephant ear, or orchids, because the timber holding sufficient moisture. Crock of wood (ravine), can also water plants for the container, provided the inside be layering first with asphalt so that water-resistant. Buy a crock pot or requires wise. In addition to the basic material, the size of the pot should be able to anticipate the growth of plants. After much time, plant size and shape will change. That is higher and more broad. Can be, and container plants are suited to appear at the beginning of the planting will not be proportionally longer. Then the vessel is too narrow will hamper the growth of plant roots which in turn also reduce the plant display perfection. Physical form of the plants also need to adjust the shape and height of the vessel. For example, canopy trees and a broad rounded will appear elegant when the pot not too high and convex shape. Whereas plants that boast of a vessel requires a bit too high in order to appear balanced. Similarly, for plants that are to dangle down. Model crock pot or should not be ignored, especially when things are trying to use as decorative elements of the garden. Avoid selecting a model pot size too crowded when the garden is limited. Form / model is strictly linear, simple in appearance, it will be placed after the prominent in the garden. In addition to tools display ornamental plants, crock pot, and now starting work as an aesthetic element in the garden. Although no plant is empty, but if the materials, shapes, and colors chosen vessel and placed with the tasteful, the vessel is thus will appear as an ornamental and functional point of interest garden captivating. Similarly, if some of terakota pot or a clay plain and simple, consisting of various shapes and filled with ornamental plants from the same species, are styled in an artistic group. The results certainly make you proud!